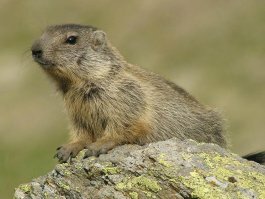 The European marmot (marmota marmota), in German Murmeltier, in Ladinian muntagnola, in Italian marmotta, a rodent belonging to the family of the Sciuridae, is a mammal very frequent in the alpine and sub-alpine pastures at altitudes between 1500 and 3000 m, and is well known to all visitors of our mountains. It is up to 50 cm long, tail excluded, and generally weighs about 5 kg. Rather heavily built, its short limbs ending with claws suitable for digging, it can move however with surprising agility. Its fur, grey to brown, is thick, rough, and provides a good shelter from the severe mounatin climate. It lives in small familiar groups, numbering up to 10-15 individuals, sometimes grouped into “towns”, where terrain allows it (up to about 100 individuals per sq.km.). Its primary needs include both good pasture grounds and the opportunity to dig wide and comfortable dens, comprising many rooms and several access and getaway burrows. A marmot’s winter den, on the contrary, has a single access burrow, several meters long at times, which is carefully plugged before hibernating, and a single comfortable room lined with hay. The marmots’ hibernation lasts from October to April. A typical feature of the marmots’ social behaviour is that of leaving one or more “sentinels”, often standing up, watching the small flock grazing. If a danger, usually a predator, is sighted, a sequence of high-pitched whistles recalls everyone to the den’s safety. It seems that these whistles are coded according to the type and the imminence of the danger. All marmots in the Fanes’ area have been slaughtered (for food!) by soldiers of both armies during the first World War. The many animals that can be encountered today, therefore, all come from repopulations. In the Fanes’ saga the marmot represents the symbolic animal, the tribe’s “totem”, with which the Fanes even identify themselves. It is possible that this identification took the move from an ancestral behaviour of the Fanes themselves, i.e. taking shelter in the caves of their highlands as soon as enemy was approaching.